Welcome to the San Diego Electric Railway Association! We are in the process of updating our website and you may find some pages look rather different. Pardon our dust while these changes are made and we freshen-up our look! SDERA has been selected to receive one of the ORIGINAL San Diego Red Trolleys! MTS Car 1002 - a U2 car from Siemens Duewag - first made its appearance on the San Diego to San Ysidro run. This wound up proving to the rest of the country that Light Rail was a viable alternative to cars and buses. Many of these cars have been scrapped, sold off to Mendoza, Argentina, or put into long term storage for possible sale to another agency far away. UPDATE 3/27/18: The car is due to arrive at The National City Depot VERY early on Friday morning March 30, 2018! We, SDERA, will need to pay for transportation for this car and for the necessary changes in the yard to support this vehicle. This is where we need YOUR help! We are in active fundraising mode to cover these costs. Please consider donating to SDERA one of a few ways... at the Depot (cash, check, charge), via PayPal on our website's Donate Page, and via our GoFundMe Page. While the trolley line runs so close, we can't have it delivered nearby. There is no viable method to deliver it via BNSF on the rails next to us. The only option available is trucking it down. We will also need to rent some equipment to complete the final move process. Want to be remembered for your contribution to preserve San Diego history? We will be placing brass acknowledgements in the car for donations over $500. Many companies will match contributions of their employees. If you would like to participate in one of these programs, contact Chris Higgins - ) for any the details that are necessary. SDERA is a qualified 501.c.3 non-profit corporation and this may give you a tax deduction (contact your tax professional for details). If you can't contribute financially, please watch for upcoming Work Parties as we prepare the yard for this shiny addition to our Museum. As you can tell, things are really moving fast and we need your help - financially and physically! Please consider how you can help make these changes a reality. If you have any questions about this, contact Chris Higgins - , or our President, Mike Reading - . Car 54 Has A New Home! 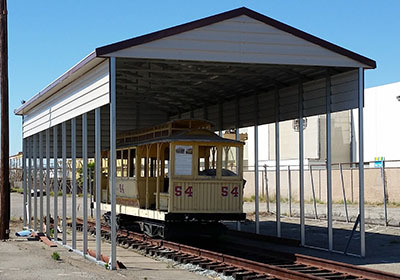 The National City Depot is now the home to historic SDERy Car 54. Thanks to a grant from the County of San Diego, the car is now safe under a cover. SDERA volunteers moved the car to its new home and up on a section of rails to protect this unique artifact! This is not your typical streetcar. It is actually two cable cars that were put together! SDERA has been gifted a 1946 St. Louis Car Co. PCC streetcar from the San Diego Vintage Trolley, Inc. from their fleet. 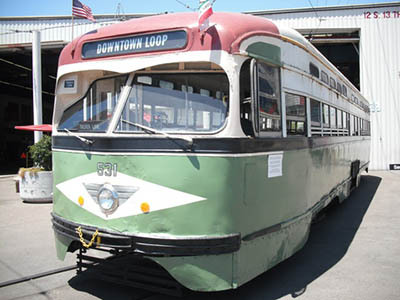 Car #531, presently at the downtown San Diego trolley, will become part of the exhibit at the National City Depot and will not restored to service by the San Diego Vintage Trolley group. The San Diego Vintage trolley already has car # 529, which has been beautifully restored and will return to service soon after extensive rewiring. Two Philadelphia cars and a New Jersey transit unit are also still slated for restoration and operation. San Diego Trolley's new fleet of cars has left little room for the larger fleet of PCCs. The fate of car #530 has not been announced yet. The 531 was formerly Muni 1170. Some items have been restored while others have not. It had roof repairs in April 2013 so it can be displayed outside. Funding sources are being explored to move the unit the short distance to the National City Depot. For additional details on how to donate, see our Donate page. Donors who wish to be recognized will have their names memorialized in a prominent place on or in this car. Old Spaghetti Factory Birney Car Sports Historic San Diego Colors! The Birney Car from the Old Spaghetti Factory restaurant in Downtown San Diego was purchased and donated to the SDERA by Sam Judd, one of our members in memory of his father, long-time streetcar fan Lyle Judd. The car was removed from the building (quite a feat!) on Monday, February 14, 2005 from a hole on the 5th Ave side. It is now in the south Depot yard. Photos of the move can be found in our Photo Gallery. For more information and picture of the car inside the restaurant, see our February 2005 Newsletter - Trolley Lines. For pictures of the move, see the April 2005 Newsletter. 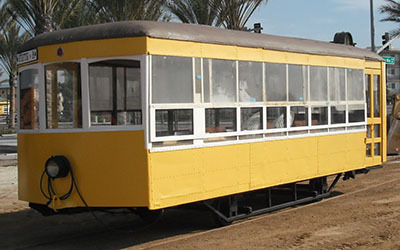 This car now has the yellow scheme from the 1916's with the yellow body and brown roof and numbered 336 to be consistent with San Diego Electric Railway Company road numbers. We Can Accept On-line Donations! SDERA has its own page on Facebook! Tim Higgins and Jeff Trimble are making sure that it has the latest updates! You can "Like" us and stay informed when things happen down at the Depot or within the organization! For a sneak peek at what is there, check out the activity on our Contact SDERA page. Preserve the artifacts and equipment of the San Diego Electric Railway and other related local companies. Establish and maintain an active railway museum, complete with an operating, historic streetcar line. Serve as an educational resource showing the important roles streetcars, interurbans, and electric railways played in the development of the San Diego area. 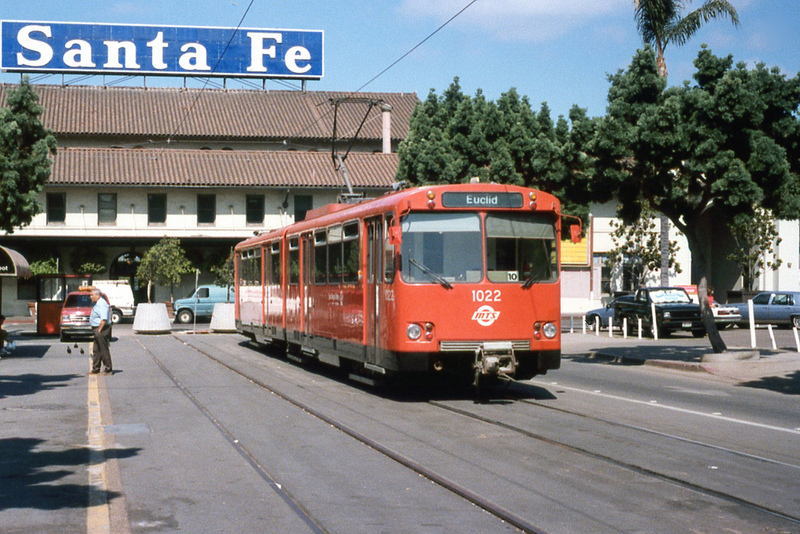 Preserve past and present pictures, publications, and artifacts of the current San Diego Trolley. Financial and equipment gifts from people, corporations, and organizations interested in preserving San Diego's railway history make SDERA's work possible!